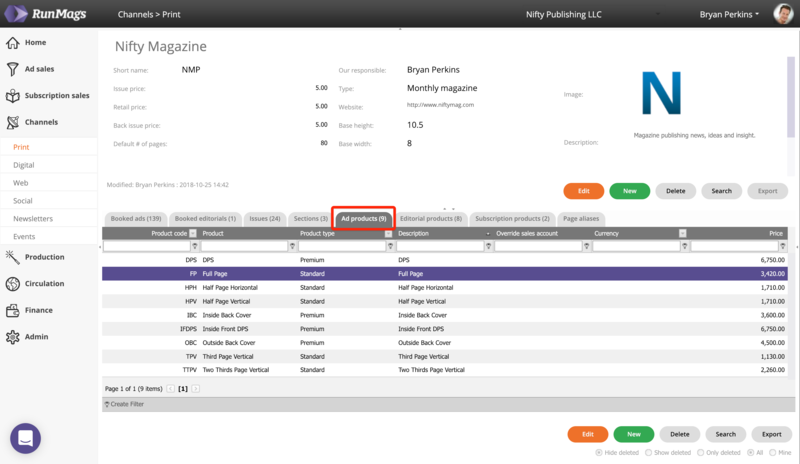 Manage your product inventory for your print magazines so that sales reps can add them to proposals book orders. In tab named Ad products you can find any advertising inventory for your selected magazine. To add a new ad product, click the green New button. To edit an ad product, click the orange Edit button or double-click the selected item. The product code is a short identifier used in dashboards, etc. If you manage several publications, you may want to distinguish between them by adding one or two letters at the beginning of the code. For example; NM-FP and EX-FP. The name will be displayed in deals and proposals. Type is used to distinguish between different classes of advertising, for example Premium vs. Standard. The values of this dropdown field is managed under Admin. 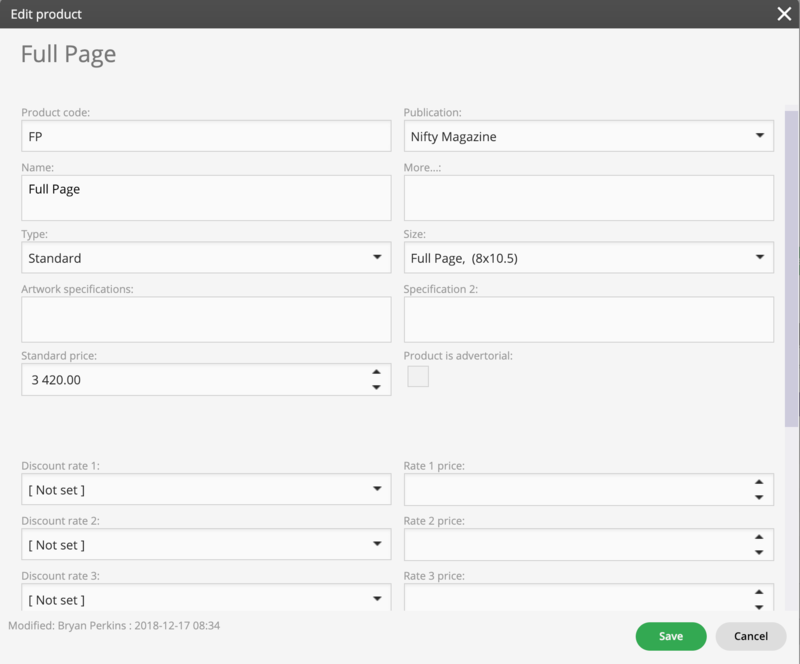 The publication field is populated by the magazines added. The size selection is used in the flatplan. Artwork specifications can be automatically included in artwork reminders sent out by email. Standard price is the list price communicated in proposals. By checking the checkbox for Product is advertorial, the product will be colored differently in the flatplan, compared to regular advertising. Preset discount pricing can be set for each product. The values of this dropdown field is managed under Admin. Select one and assign the price. You can set up several preset discount rates to make sure your sales reps use the correct pricing in proposals, for example for 3X, 6X, 12X, etc.